This list is a compilation of Ford vehicles that have alternators that APPEAR to be compatible. This is NOT a definiate list, so please do not treat it as such. These vehicles listed are equipped with three-bolt fixed alternators which appear SIMILAR to what the Ranger* uses with the intent to provide a list of possible vehicles to choose from. No promises, warranties, or guarantees are implied under any circumstance. Continue at your own risk! Always have used alternators checked before installing! Ranger-Forums is not responsible for any mistakes, loss, damage, or injury involved with any swapping, modification, or any other such activities. With the disclaimers out of the way, let's get on with it. 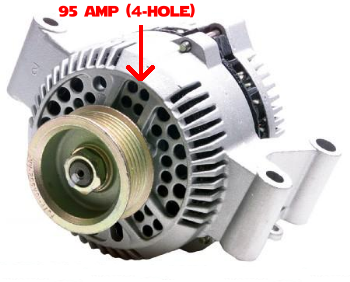 Do you want to ditch your 95 amp alternator for a 130 amp alternator? This is a popular swap done by many, including myself. With a 130 amp alternator, you can add more electrical accessories without reducing the preformance of other accessories or lights. "The Big 3" is a perfect supporting mod for the extra current, and is very popular with the users of high-power audio systems or bright lighting. Your first instict may be to buy a brand new one, or a remanufactured alternator. If you have looked alternators up, you're likely to not be thrilled by the prices you see. After all, not all of us have 100+ dollars to throw at an alternator. Your next option would be a used unit, which is usually a fraction of the price. Salvage yard or internet purchase aside, you need to know which vehicle you can use an alternator from, especially if your selection is slim. That's where this list comes in. I have cross-referenced alternators from several Ford vehicles using RockAuto, AutoZone, and O-Reilly Auto Parts which APPEAR to work with the 3.0 and 4.0 engines on the Ranger. Note that I said 'appear to work'. Since not everything in this world is clear cut, this list is designed to narrow your selection down to some possible results. Of course, do realize that there is a risk involved that it may not work for one reason or another. Now, onto technical. The Ford Ranger is commonly equipped with a 95 amp alternator, although higher current alternators were available for later year Rangers from the factory. This is what the 95 amp alternator appears as. Note the four hole pattern on the case. 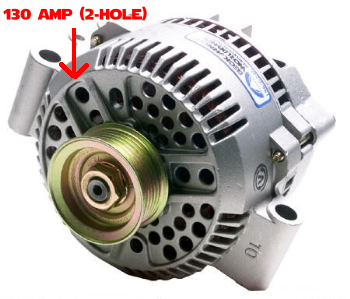 This outright designates that it is a 95 amp alternator. This alternator is a 130 amp alternator. Note that the diameter is bigger, but also note the change in hole patterns. Instead of four, we have two. This designates this alternator as a 130 amp alternator. Unfortunately, not all alternators that are 130 amps in capacity are marked this way. Some alternators look more like this. No holes to speak of. Of course, this naturally throws up a red flag. How are you supposed to know what it's rated for? Unfortunately, there's rarely a clear cut answer. Regardless of case design, a 95 amp alternator will be smaller than a 130. Also note that some vehicles were only offered with one rating of alternator. Others were offered with more than one. 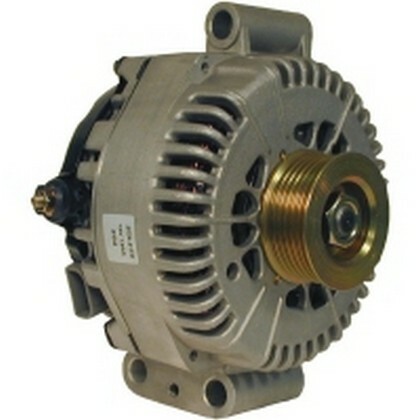 Do note that although an alternator may be swapped from a vehicle to another vehicle of different models, some characteristics of the alternator itself may be different, such as pulley diameter and width or electrical connections. Only models/engines with plausible compatible alternators will be listed. Incompatible engines/models will not be listed. The OHV 4.0 was offered with both 95 and 130 amp alternators. SOHC does not appear to have been offered with the 95 amp. The 5.0 V8 appears to have been only ever offered with the 130 amp alternator. Offered with 115 and 130 amp alternators. The Taurus 3.4 V6 appears to only be offered with the 130 amp alternator. Many places list this as a difficult install. The Ranger was offered with a 130 amp alternator (as well as 110-115) between these years as stock. Offered with both 130 and 95 amp alternators. Offered with 95, 110, 115, 130 amp alternators. Ranger compatible alternators were offered throughout 1997 to 2008, however the 130 was no longer offered after 2003. Strangely, the 2004 F150 model year is not listed for the 4.2 engine in Rockauto. Any and all photos are property of their respective owners. Thank you for that bit of info. I've added it as a quote in the original post. You're welcome. It's amazing what boredom can help you achieve. i know its been a minute since this forum was alive, but is there a way to see how many amps the alternator makes at idle? I pulled a 2006 explorer alternator (130 amps) and want to make sure I don't fry my computer. Most newer vehicles run 90amp alternators, this means they need about 40amps max with all electrics on. Voltage is another thing, it is unusual for an alternator to fail with high voltage, but it is possible, maximum voltage is 15volts DC in a vehicle, above that and electrics can be effected. Last edited by RonD; 11-20-2018 at 12:17 PM. And to help if you're wanting to get a little more anperage at idle, you can throw a smaller pulley on it too. It'll spin a bit faster to mimic the factory pulley at a higher rpm without actually revving the engine. Would it be safe to say this list compilation would be only for pre-2010 models then?